# I am interested in how small bits of individualized instructions can create collective action. # In this simulation I will give a single instruction to each individual in the swarm. # Choose another individual who is not too close, then accelerate towards that individual. # I also control momentum causing the previous movement and direction to only decay at a small rate. 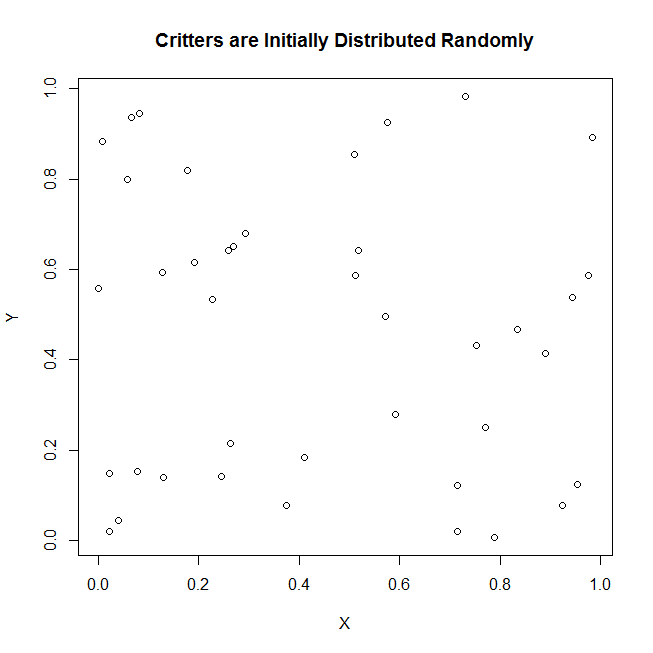 # Critters are initially distributed randomly on a 1 x 1 grid. 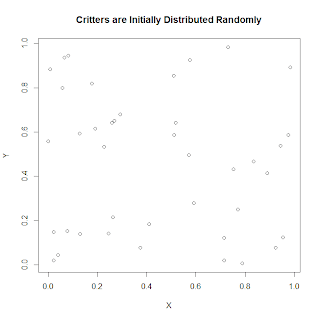 plot(xypos, main="Critters are Initially Distributed Randomly"
# Now let's imagine that each critter has an ideal safe distance from each other critter. # If another critter is not at that safe distance than the critter will move towards the closest nearby critter. # First let's check how close each critter is to each other critter. # We will accomplish this by going through each critter and checking how far away each other critter is. # In order to prevent critters from always chasing whatever is closest to them (and themselves) we drop anything which is closer than the safe.distance. # The apply command will apply the order command to each row whiel the [1,] selects only the critter that is closes. # This calculates the difference between the current position of each critter and that of the closest critter. # To see how this is calculated, see my previous post simulating a werewolf attack. # Now calculate the difference in the horizontal and vertical axes that the critters will move as a projection into the direction of the closest critter outside of the safe zone. # This corrects the movement to ensure that the critters are flying at each other rather than away from each other. # Let's turn this into an animation. # Generate xy initial positions. # xypos0 will hold the position of the critters the previous time. # Loop though all of the loops. # This specifies the range to be graphed. # This centers the plot at the middle (0,0) if the plot width is also set to be fixed. # Draw arrows. The start of the arrows is the previous periods location. # Show the grid in the background. # Drop those within the safe zone. # This selects the critter closest to the selected critter. # This fancy dodad allows half of the change in movement to be due to random variation. # Set the previous round's xy position to be equal to the current round's. # Update the current round's. # This is only used in the event that the animate package is in use. # You must have imagemagick installed for this to work.